Super Junior’s Leeteuk shed tears as he honestly opened up about the difficulties of being a leader and a celebrity. The latest episode of tvN and XtvN’s “SuperTV” that aired on March 16 had the members pair up and live together, with the rule being that they couldn’t be apart for more than five minutes. Things started a little rough for Leeteuk and Kim Heechul as they weren’t quite sure of what to do, being polar opposites with likes and preferences. Heechul suggested to Leeteuk that they visit a psychological counseling center together, and Leeteuk reluctantly agreed. Heechul later revealed in a separate interview that he had set up an appointment to help Leeteuk as he said, “He’s been running non-stop without taking a break. He hasn’t been able to speak up when he’s worn out and he doesn’t really talk about his feelings that much, so I decided to put my faith in counseling.” Leeteuk also revealed that he’d been mentioning to Heechul that he was feeling tired these days, but he’d initially been hesitant to visit the center because he wasn’t sure if he wanted to open up about his emotions on camera. Each of them took turns talking to the counselor, with the other listening in as the session was going on. 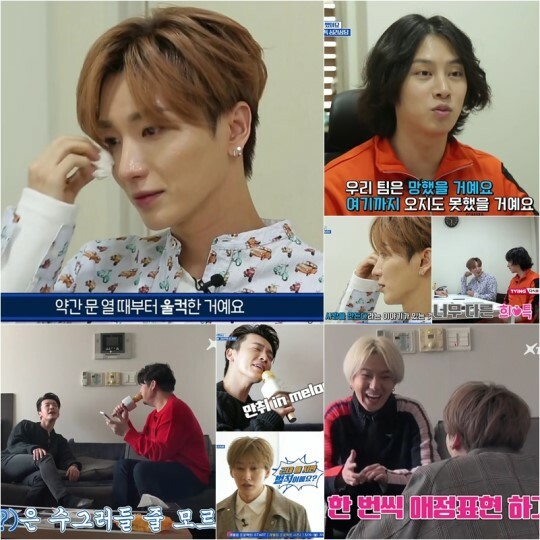 While Heechul was talking about his difficulties controlling his temper and not being able to hold a long relationship, Leeteuk listened in and said, “Even when things get tough, celebrities have to keep giving out good energy.” He added, “I don’t want to show the human Park Jung Soo (Leeteuk’s real name) side of myself,” showing that he was still cautious about opening up about his troubles.